Just a reminder for those of you who really want Windows 10, but still have Win7 or 8.1…. The “assistive technologies” free upgrade from Win7 or 8.1 to 10 will apparently be pulled on December 31. I say “apparently” because, well, Microsoft. The end of life for this particular free upgrade path was announced/discovered back in October. As I’ve mentioned many times before, if you upgrade a machine to Win10, Microsoft keeps track of that fact, and you’ll be able to use Win10 on that machine forever (to a first approximation), even if you revert it to Win7. Still no word on whether Win7 and 8.1 keys will continue to activate Win10 installs. This topic contains 43 replies, has 18 voices, and was last updated by anonymous 1 year, 3 months ago. I’m one of the “two of you”. As I mentioned on the Festivus Airing of Grievances thread, until Windows 10 & Edge become more stable (AKA a lot less buggy), I wouldn’t upgrade to Win 10 until Win 8.1 almost reached end of life. Then I would buy a new Win 10 PC. I was ready to pay for an upgrade anyway, so the “assistive technologies” loophole was nice to have (as long as it lasted). The quote you are referencing is from August 2016, so I doubt it has anything to do with this decision. I think Microsoft left the free upgrade open deliberately, as other upgrade methods (Media Creation Tool, product key of 7/8.1) also still work. Seeing as this went on for 1,5 years in which it was mentioned countless times on news websites and forums, I doubt Microsoft was unaware. It’s a marketing ploy. At the end of GWX, Microsoft tried to start a stampede to Win10 with “get it quick, free is going away.” This is the same thing. They have been aware of the loophole since the end of GWX. It’s a scare tactic – get it NOW or you will miss out on the “free.” And the wording about “abuse” is just to attract attention. Sometimes, you might think Microsoft as an organization is smarter than they are, voluntarily leaving the loophole there to get as many people as possible on 10, since there is no monetary incentive to leave anyone on an earlier version and maybe they would like to accelerate the transition to this new monetization platform. But… they write something like what Bill said and then you realize maybe they are just clueless and it took them months to realize that is not what they wanted although it is not in their interest to not want that. Then, one should not be surprised that they will be as clueless observing the fall of the PC that they created, thinking that it was inevitable and they have nothing to do with it, watching Apple’s share rise and thinking they should copy them even more, but mostly the worst aspects. When I read the insider’s emails, I feel like these people live in a very different world. They seem like they genuinely think are building the best OS ever that will make everyone happy. And once it sinks in that this specific group deserves good treatment, it may become apparent that we all deserve good treatment. Yeah, I don’t expect a change would come before I passed out. I don’t really expect any change at all. But I will write in support of an observation that what we see is ethically wrong. When I read George Orwell the first time, I always imagined Big Brother forced the technology on an unwilling and powerless people. I never considered we would ask for, and pay good money for the privilege of having several for-profit companies do the job. Apologies if this pushes the boundary of off-topic. Even this ‘free’ upgrade won’t sway me. I’ll stay win7 until its truly EOL, and if no alternative arises I’ll go win8 until its truly EOL. Hopefully by then I’ll have something truly alternative to win10. Same here, I will stay on Windows 8.1 until it’s EOL. By then either MS will have smartened up, or a viable alternative (Linux for more technical users I’d imagine) will be ready for use. If you have a fairly standard hardware, Ubuntu out-of-the box is just ready for use with all the basic software (e-mail client, web browser, office suite) already installed and a much more friendly space than Windows 10. There is a true alternative to Windows 10 right now — Linux Mint. Give it a try – you can run it off of a DVD. Or, if you are planning on getting a new hard drive, get one and install Linux Mint on it, and try it for a while. You will be very pleasantly surprised at how easy just about everything is. As I’ve mentioned before here, at Woody’s, I do have a Windows 7 (Professional, SP1, x64) and a new Mac, recently acquired. Both are laptops. The Windows machine is already six and a half years’ old, but it is quite fast (with a I-7 four-core [or 8 virtual CPUs] processor, running at 2 GHz, with 8 GB of central memory and a 0.75 TB internal hard disk). So it is, still, a pretty good and fast machine. I use it now mostly for developing software that can run under Windows and for compatibility when communicating with people with Windows machines (much less of an issue, these days, than it used to be when I first got this PC). With a new battery, that I bought this year, and only one little-used key already not functioning, it is probably good for some years more and beyond the Windows 7 EOL of January 2020. I could “upgrade” it to 8.1 now, but reading about what would be involved and the problems that might occur in the process does make me, frankly, all sweaty and queasy at the very thought of bricking a perfectly good piece of hardware that I would rather like to keep on using. And all that to prolong the usefulness of the PC for just another three years, which might prove too long for it, old as it already is, but probably will not. A less potentially drama and hassle-filled alternative, at least for me, would be to keep using the Windows 7 machine, mainly for some of the software development work, until its guts finally give out (and then, maybe, buy a new Windows Whatever machine, assuming Windows is still around), keeping this one permanently off the Internet after January 2020, and using the Mac for most everything else, including communicating with the outside world. That would work if I had also a simple way to have the two machines taking to each other — but not through the Internet — whenever necessary: an USB memory stick might do the trick, perhaps. But I wonder if there is a more convenient way of doing that which someone here might like to suggest. If so, I thank you. A NAS Drive (Network Attached Storage) is a wonderfully simple way to share the data. You can map Win and MacOS to the drive, and it just becomes another drive letter in Explorer/Finder. Seagate provides NTFS for Mac OS X (by Paragon) so there is no format-for-one-and-the-other-can’t-see-it. I use all my external drives and USB drives that way. After looking this up on the Web, I gather (please, correct me if I am wrong) that one gets the NAS/RAIM home server plugged into the mains, connects it via Ethernet cable to the home router, then (maybe through the NAS manufacturer Web site?) sets up the thing so both PCs can be connected to the server in order to share files between each other. It looks like this connecting is done, in each machine, by clicking on an icon on its screen that brings up something like a login dialog box. 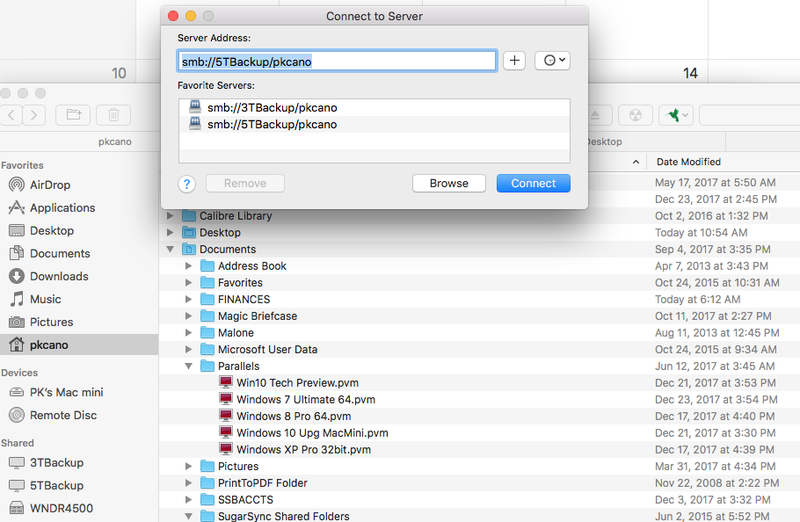 After logging in, one can see, open, or copy a file in the NAS server saved there with either machine. If one would like to be extra secretive, instead of using the router’s WiFi, one could turn off the radio receiver in both computers and connect them with Ethernet cables to the router, instead. The RAIM can be used to back up both PC and Mac (i.e. as the Mac’s “Time Machine”). There is also the possibility of leaving the machines on when one leaves the house and then connecting remotely to them from another machine or a cell phone from elsewhere using a software “app” provided by the NAS makers. Not that is likely I’ll ever do that, as I’ve never have had any need to connect to my home machines from somewhere else, or can imagine a situation where I would need to do that in the future. In fact, the whole idea, in my case, is that one of the machines, my old, and by then no longer updated by MS, Windows 7 PC will be quarantined, kept off the Internet, for ever. Ditto about using a Cloud service. The NAS drive looks like an external hard drive (physically). It connects to the router by Ethernet cabling. It is basically a hard drive with a file server built in. You can see some examples here. It shows up on the network like another piece of hardware. You can map a drive letter to your PC, it will show up in Explorer or Finder like it was another drive. The same way it looks it you plug in a USB drive. Connecting on the Mac looks like this. See backup drive listed under “Shared” on left. You can also share the folder in Windows and pull it up on the Mac (and read/write to it), or share the folder in Mac OS and pull it up in Windows. (Sharing from Windows to Mac is a lot easier, however, and the recommended route I’d take.) The main issue here is if the PC is off, the Mac won’t be able to access the files. Alternatively depending on how much data is involved you may be better off using Google Drive, OneDrive, or Dropbox to store the files and access them on both machines. I would recommend Dropbox if <2GB of data, or Google Drive if >2GB of data. The benefit to this method is that you don’t need to worry about whether the “sharing” computer is on, and you also don’t need to worry about a failing HDD and losing data (since it’s in the cloud and therefore you have data redundancy in case of hardware failure). Oops… I meant to write “RAID” (as in “Redundant Array of Inexpensive/Independent Disks”) but wrote instead “RAIM” (“[GPS] Receiver Independent Integrity Monitoring”: a system for checking out, as they come in, that the GPS satellites and related signals being received are OK). A case of getting some tech-related wires crossed. What I like to do is buy a new hard drive and clone the old one. Then using the new hard drive I upgrade the OS. If anything bad happens I can reinstall the old hard drive and it’s like nothing happened. I keep the old drive as is for a few months to ensure against drive failure. After that the drive can be used for other purposes such as backups. USB enclosures are cheap. I could “upgrade” it to 8.1 now, but reading about what would be involved and the problems that might occur in the process does make me, frankly, all sweaty and queasy at the very thought of bricking a perfectly good piece of hardware that I would rather like to keep on using. I don’t think it’s such a big thing as that. When I migrated from 7 to 8.1, it would not allow an in-place upgrade, and installing cleanly is not difficult or risky, really. It’s tedious to get everything set up again, but not anything that should be giving you the sweats! You should always have a backup first before doing something like this, but you won’t really brick it. It would be soft-bricked at worst, but no more so than if you had just installed a new hard drive and had to do something to make it bootable. It’s easily reversible if you have a backup. Three years is a really long time in tech, and you’d only have to perform the upgrade once. Over three additional years from the end of 7 until 8 ends, you’d end up doing six upgrades if you were on Windows 10 over that same period of time. – run over W10 with a road roller, back up and repeat 5 more times. – if still moving, empty the contents from a concrete mixer over top and re-roll. – insert ‘hazardous waste’ sign before dry. Thank you, thank you, thank you, so, so, so, very, very, very much Microsoft. Wow, Never thought I’d say that. But seriously, Thanks MS for every statement you make and every action you take that constantly reaffirms my decision a few months back to trash everything Microsoft from my life and migrate over to MacOS and Linux. Abusing MS websites!!!??? Get real. I seriously doubt that MS websites are either more or less abused than any other sites. After contemplating the OS situation for months now, I’m afraid it doesn’t matter whether it’s free or not. I’ll pass, but thanks. I would also accept reasonable bids for using my hardware and my time to test their software under license. But that might make me a contracted employee. And Microsoft believes those are expendable. How did we arrive at this arrangement? By going along with the plan. I am actively evaluating Linux versions and plan on being completely MS free before Windows 7 is totally unsupported. Actually, I could kick myself for not doing this sooner. MS has made my PC life miserable for at least 2 years and I can’t think of any reason why I would stay with them. Of course, that is just me. However, I think I stand with good company. We may never be enough to be called “main-stream”, but I view that as a PLUS after the last 2 years with MS.
It’s nice to have loopholes because who really wants to pay for Windows 10, right? For me its just more of a ho hum sort of upgrade then any negative or positive. Windows 10 is something were all stuck with accepting eventually. Or were going to move on to something else for a OS. Not saying much about Windows specifically, but for most OS any upgrades happen for free and there’s hardly any incentive to pay for them anymore. Microsoft still commands a price for Windows but clearly those days are numbered as it gets harder to sell something most feel has little value. If Windows OS disappeared today I could go on without it very easily. I use it only because of convenience, support, and the PC’s I buy come with it. If they came with something else, I could easily adapt. I was a Win7 holdout for the last several years, and despite trying Win10 out several times and several versions including LTSB, I always reverted back. I’d already started dual booting Ubuntu MATE, I already had my plans laid out to use Win7 for Steam games not ported yet in 2020 and Ubuntu MATE for everything else. Then I started my new job with a new company a few months ago and I had to use Win10 1703 every day. And everything changed. I went from being a Win7 stalwart and a Win10 refuser to a Win10 accepter, maybe even lover. 1703 is a very solid OS. It’s not a popular opinion, and it’s not shared by most of the Ask Woody visitors, but, it’s my opinion nonetheless. I don’t see any chirping from 1703 that alarms me. Granted I’m not actively blocking things in my router, and I’m not pouring over connection logs. But I don’t see anything alarming. As far as I can tell, once you adjust Win10’s privacy and security settings, same as you do in Win7 and Win8.1 now, well, Win10 doesn’t seem to phone home and chirp like people think it does. Maybe I’m giving it too much rope and assuming it won’t hang itself. 1703 reminds me a lot of Vista SP1. A lot has been fixed. The OS has been made more whole. Just like with Vista pre-SP1, I think that Win10 1511 was a decent OS. But it needed a lot of help. One of the things I especially like about 10 now is the deferral policies. Rather than having to disable Windows Update altogether, or, tell friends/family/customers not to install updates for a certain period of time, I can defer the updates. I don’t have to tell them anything. They use WU like any normal person would, but with my settings in the background, they’re not getting or installing updates that haven’t had the incubation period yet (and the inevitable MS-DEFCON rating improvement). From a sysadmin and “friendly neighborhood PC fixer” standpoint, 10 is my new best friend. Is it perfect? Heck no, absolutely not. Things have been stripped from Pro that never should have been. Concessions have had to be made that weren’t on the table before. However, is it still a very good OS? Absolutely. I say all these things not to try to convert anyone, but just to offer a differing opinion. Again, the majority opinion of the Ask Woody visitors and regulars seems to be that 10 needs to be taken behind the woodshed – and I don’t feel as if that’s the case. You describe my path very closely. And I agree with your balanced observation of Version1703 maturing into a proper product. I really truly was close to getting back aboard the windows cruise ship for home use in time for this holiday season’s discounts. And then 1709 happened. Good thing I am a late shopper. I’m not claiming special insight into the whys and hows. If I had the skills to do all of this by myself then I never would have started an AskWoody habit in the first place. I cannot foresee when the next problem is coming. But I do feel strongly that if I stay with Microsoft, that next problem will come sooner rather than later. 1703 was released in early 2017. At a point nine months later you find it stable. The problem is, you can only defer feature updates for 365 days. So in three months you can only hope that 1709 will be as stable as 1703 is now, because at that point you will be forced to start all over. And you will have to do the update before 1803 (or whatever it’s called) is released, because you certainly don’t want to be the alpha/beta tester for that. And you’ve also got to hope that Microsoft doesn’t have an “accident” (yeah, right!) and force an upgrade on you like it did with GWX and again recently forcing 1703 users to 1709. Well, to be fair I don’t recall having any stability issues with 1603 either, but I didn’t give it a “fair shake” (like I have 1703). Again, maybe I’m giving them too much rope and expecting they won’t hang themselves. I expect a lot of things to happen (or not happen) in the next 3 months. D) I’m forced to 1709 and it’s a mess, and I throw my hands up, wipe and reinstall 7 yet again (which luckily these days most OS wipe and installs take <1 hour, plus being on SSD’s behind a 100Mb/s cable internet WAN connection, I’m also ok with). I’m running pretty stripped 1607 Enterprise at work and I find it decent (worse than 8.1 due to scaling issues I’m having constantly and Excel 2016 is a nightmare). But still wouldn’t recommend it to anyone. On top of that, you rather can’t run the Enterprise version at home officially, right? I was reading your opinion on 1703 and although I respect it, I didn’t understand it. The fact you say it takes about only an hour to install Win 7 tells me we are very different when it comes to tuning Windows and maybe that is why maybe it doesn’t matter that much to you what Microsoft does with it as long as the OS doesn’t crash. For me, installing Windows is a big job as there are so many settings I change. Same thing with all the apps. It takes a good day to complete the whole install using a written procedure. Not a small task. So then, when Microsoft arbitrarily change settings during a feature update, this means I have to check them all because I don’t know which one they changed that will make me unhappy. And Microsoft has a habit of picking the wrong default setting for me so I can’t trust them on this. I have this idea that Microsoft is slowly going the way of Apple with a simpler set of settings. On IOS, I can review all settings in about 2 hours after a big update, although the latest one was more messy. In the long run, I would not be surprised there would be a Windows where you are not really the administrator no more, but you have a few settings you can control in the new settings panel, the rest being locked like on IOS. It does make some sense for many users, but the locked down settings need to make your computer more secure and respect your privacy or else it doesn’t work. Thank you for having the courage to share your dissenting opinion. What are you changing that requires that amount of time/effort? Genuine curiosity here – no offense meant. In 7, I change only a few things in local GP – Windows Update settings and disabling CEIP. I show file extensions and hidden files in Explorer. Configure my network, add my networked printer. Share approximately 8 folders off a drive to “Everyone” and disable password protected sharing. Add 1-3 additional user accounts (as users) for the rest of the household – depending on which PC it is. Sign in as those users, set up their local profiles (takes maybe 5 minutes each). I have a college degree in Network Systems Administration, yet I don’t run a super tight NAT at home. I block all inbound by default of course, and only have 2 port rules allowed. That’s the extent of my LAN configuration (aside from having WiFi secured). I see no reason to block outbound at the NAT level; I let Windows Firewall alert me and block at the PC level, if necessary. I really honestly don’t understand why or how it could take anyone hours and hours and possibly days to configure Windows – even despite the fact that I install approximately 25 applications manually (LibreOffice, GIMP, Inkscape, Scribus, SumatraPDF, Steam, Discord, Notepad++, VS Code, KeePass, Homebank, browsers [Chrome, Firefox] and some others). Not using Ninite here to save time – prefer to do it myself. No command line here, though I probably could if I really wanted to. I set lots of settings to a default maximum security or privacy when possible. I find Microsoft has always been biased toward maximum functionality over security, privacy and productivity, for better and worse. It takes time to go through all the settings. I now import a GP file too and a huge registry file for lots of settings like show file extensions. I completely change the awful launcher to one that is more like the Win XP one, where Windows are displayed with their title in the taskbar so you easily know which are where and don’t need many clicks or an alt-tab cycling to find what you want. I change many defaults in Office and in the apps I install, although Firefox and Thunderbird a pretty quick to set up. Avast takes a good 10 minutes to do and change all settings. I change default settings for Reader when it is installed so it is more secure. I install EMET and import a customized list of settings (now I won’t with FCU). I uninstall app store stuff with powershell commands, I uninstall protocols I don’t use, I remove animations and other annoying visual effects, I change the system protection settings, the swap file settings, I change power settings, indexing settings, lots of IE settings, WMP settings, I set up a ReFS mirrored drive, really I could go on and on, but as I said in the beginning, I tweak for maximum reasonable (to me, when I had to do it once every 5-7 years) default security and privacy, plus speed. When I go on a computer that I didn’t set, I usually get very impatient at the way it behaves compared to the very clean speedy set-up I have for me and my users. Everybody at work that worked somewhere else are impressed by how fast and to the point their computer is. For me, the default installation of Windows feels like it is slowing me down and prevents me from being as productive as I know I can be. Sometimes I thought maybe I will have to make a list of the absolute minimum I have to tweak because Win10 keeps forcing a big install every 6 months, but it is disappointing to think I would have to do it. Maybe some of the things I do are not necessary for many people. I like to think that due to the way I set-up computers, it helped my users avoid at least some security issues, although by itself it isn’t enough. I like to read that you find 10 great now. It means probably a lot of sysadmin like you will feel that way and it tells me Windows is definitely not going to change direction the way I would like it to be, so this is important information for me. I am the one who will have to adapt. Go through weeks of installation, tuning, pain for a few months of usable life? When the numbers don’t work, they just don’t work. The only thing numbers like “6 month release cycles” DO work for is end-of-lifing the product. “Weeks”? I never said anything about any of that taking “weeks”. I literally go through 5 minutes of tuning after the 20 minutes of installation (if that). And all that pertains, really, is importing my already-set local GPO, which takes less than 2 minutes. If I have to tweak it manually, it still takes no more than 5 minutes because I’m not changing much. I get my systems where I want rather quickly. Not sure if that’s due to practice, or due to not needing to tweak and tweak and tweak and tweak. Install OS, install drivers, update, tweak, install apps, use it. Quite self-explanatory as to why most Windows System Admins are Win 10 lovers. Imagine what would happen to their jobs if they are Win 10 haters. I just did the upgrade. It still works as of 1/2/18.